KANSAS CITY, MISSOURI (March 3, 2010) – For the past 3 months, legendary automotive designer Chip Foose has been working with John Deere to produce a customized 1972 John Deere 4020 tractor. Thousands of people have been following the design and build process online through video “webisodes” made available at the http://deere.com/bigbuck website and on You Tube. Interest in the unveiling has reached a fever pitch, leading John Deere to produce the event live online in partnership with social media agency, Fresh ID. Anyone with an internet connection can watch the big reveal online at http://foose4020liveshow.com this Thursday, March 4th at 1:00 p.m. PST/4:00 p.m. EST. The tractor is part of the unique Big Buck Customized 4020 Tractor Giveaway that customers can enter to win at their local John Deere dealer through June 30, 2010. John Deere chose Chip Foose to completely customize the tractor in a way that has never been done before to highlight sales incentives that run through April 30th 2010. 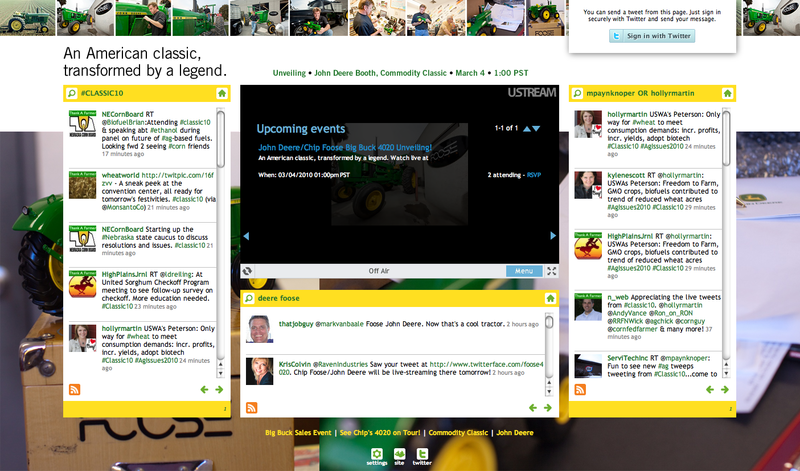 The tractor will be on display at the John Deere booth throughout the 2010 Commodity Classic in Anaheim, California March 4-6 with online replays of the unveiling available at the http://foose4020liveshow.com website. Following the unveiling, the tractor will tour the country as part of the John Deere Drive Green Tractor Experience where rural property owners, agricultural producers and other interested consumers can take advantage of the opportunity to operate and ask questions about the latest models of utility tractors and other equipment available from John Deere. The tractor, along with three gator utility vehicles, will be given away as part of the promotion. Rules for the giveaway as well as a complete schedule of Drive Green events can be found at http://deere.com/drivegreen. Chip Foose is an internationally recognized automotive designer and fabricator best known for his work on custom hot rods. He starred in five seasons of Overhaulin’ on TLC. Foose’s unique style has earned him numerous industry awards, including the Ridler Award and Best of Show at SEMA (Specialty Equipment Market Association), as well as recognition in the Hot Rod Hall of Fame. Foose owns and operates a custom shop in Huntington Beach, California. Fresh ID, LLC helps businesses around the world expand their business and reach their goals. By understanding companies from the inside out, Fresh ID designs intelligent solutions and products that help clients do business and engage with prospects and customers. Brand identity and monitoring, social media consultation and campaigns, web design, site socialization, interactive design, application development and user experience strategy are a few of the services offered by Fresh ID. More information about the company and the Twitterface application is available athttp://freshid.com and at http://twitterface.com.